Mr. Schmidt is surely right, though, that the questions go far beyond Google. “I don’t believe society understands what happens when everything is available, knowable and recorded by everyone all the time,” he says. He predicts, apparently seriously, that every young person one day will be entitled automatically to change his or her name on reaching adulthood in order to disown youthful hijinks stored on their friends’ social media sites. Err, seriously? Google’s CEO thinks that people are going to start changing their names as a way to distance themselves from their past indiscretions on social media sites? Maybe I’m just myopic (I’m sure Schmidt has a much better understanding of the future of search than I do), but this notion isn’t just scary — it seems downright pointless. Consider this: it’s in the best interest of just about any business to figure out if any of its prospective new recruits has a criminal record. And to verify that their job history checks out. And that their college degree is more than a figment of their imagination. Schmidt may be envisioning a centralized system where such critical background information is available to employers without their needing an applicant’s full name, which could make a name change worthwhile. Fair enough. But if this name-changing practice became commonplace, how long would it take for an entire industry to emerge built around helping businesses who wanted to go the extra mile and link people with their “former” identities? You can bet they’d pay for that privilege. There’d probably be a pretty hefty market for people running searches on their new boy- and girlfriends, too. And then there’s always the possibility that a spiteful ex tweets out your “old” name as a act of vengeance, or that a friend accidentally tags you under the “wrong” name on Facebook (or whatever social network is popular in this hypothetical future). Good luck getting that back in the bag — you can bet that these new-and-improved search engines are going to be far less forgiving than they are today. And Schmidt has previously said that Google can visually identify people with a mere fourteen photos, which could render this all a moot point to begin with. In other words, in an age where search will be much more powerful than it is now, a simple name change probably won’t present much of a hurdle to anyone actively looking to dive into your online past. Schmidt’s right about one thing though: society really doesn’t understand what will happen when “everything is available, knowable and recorded by everyone all the time”. 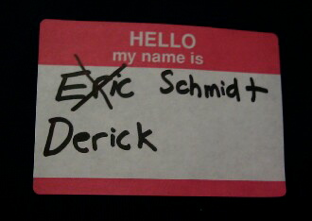 Let’s just hope it eventually comes up with a better way to deal with that problem than a new nametag.